That’s right! We are downsizing and have purchased a new builder home that will be ready in a little over a year. It’s a long time to wait, but it gives us plenty of time to get our ducks in a row such as, disposing and donating many items and it gives me lots of time to play with the exact design and decor I want for this new chapter in our lives. So if you are thinking of moving in the same direction or even if you are purchasing a condo or a smaller already on the market home, here’s some things to keep in mind. Think about how you live or about how you want to live. Ask yourselves these questions. How much space is needed for entertaining family and friends? How many bedrooms or home offices are necessary? Take the time to think about this and what your priorities will be for the next few years (we like to use 10 years in our plans). Write them down and compare them with your spouse or partner. It is so much easier to have a priority/dream list when you are out there looking for your next home. For us, even though we are downsizing, we wanted a bungalow with a double car garage, space for two home offices, a guest room and an open plan for entertaining. The layout we went with is approximately 1600 square feet without the basement. It has a very open layout with the kitchen, living room and dining room as one large room. This works well for us and when our large family comes to visit. There are two bedrooms and den in our plan and we will be converting the second bedroom to a second den. 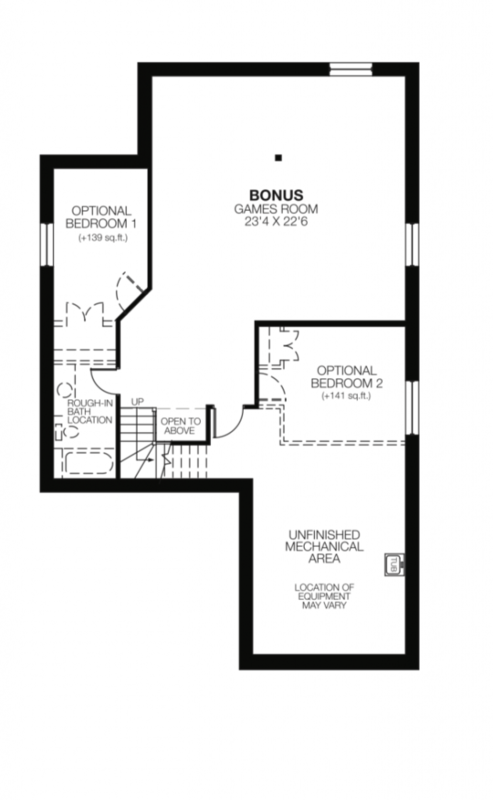 Click here to see our main floor plan from my previous post. Now onto the basement plans. This model’s basement comes partially finished with a family room and we will be completing it with a guest bedroom, exercise room and a full bath. This will give us lots of room to entertain and host family events. We will leave the family room (or games room as it is called on the plan) will stay as it is. But we will be adding a gas fireplace centered on the back wall. Bedroom #2 will be our exercise room and bedroom #1 will be our guest room, right beside the bathroom (which we are also keeping as per the plan). This gives us quite a bit of space for storage in the back room. We want the family room to have a large seating area with a projector for movie watching. I also wanted a table with four chairs for games and hobbies as well as a large contemporary shelving unit for books and other items. I think we are bringing our pool table with us so that will take up a good chunk of the space. It’s a little challenging to design as there is a post right centered about 8′ from the fireplace. I’ll be sharing a few of the design options in a later post. One thing to mention about basements is that there needs to be alot of light. So make sure you think of that at this early stage. Our builder has placed quite a few pot lights in the space so I will be concentrating on supplemental lighting exactly where we need it. So again, think about how you need the space to function and write your priority list. It’s a must! Once you’ve signed on the dotted line for a newly build home, keep in mind that the questions and decisions will be coming at you fast and furious. It can be quite overwhelming. Many major decisions need to be made quickly, so now is the time to hire a decorator or designer. They can walk you through these steps and give you some guidelines on where to spend and where to save. I’ve already made quite a few decisions, you can read some of them here. Once you’ve decided on your new home and it’s layout, it’s time to look at your current furniture and ask these questions. What can be multi purpose? What can be reupholstered, repaired or painted? I literally listed all my current furniture and then measured everything. I also thought about how it could be used (not only where it is used now). Keep an open mind about this. Lots of items can be repurposed. Downsizing can be liberating and fun! Next post, I’ll be talking about exterior finishes and how to coordinate them.